Very cool accessory sure to be a hit with Superbike owners. Ducati Motor Holding S.p.A. has provided webBikeWorld with an exclusive look at its latest motorcycle accessory. It will be unveiled at U.S. Ducati motorcycle dealers starting today. “Spiffy Spokes are all the rage in Europe” said Festo “Primo” Aprilius, the Managing Director of Ducati’s new Wheel Design Group. “Since our American customers have helped raise Ducati sales in your country from 1.6% to 1.8% in market share over the last 10 years, we wanted to give back to you this special design treatment that has been so much the same of fun for the riders of Italia” he announced during our exclusive interview. What’s so special about Spiffy Spokes? The secret is their ability to slide up and down the length of the spoke, providing continuous wheel balance at speeds up to 350 KPH, or 217.4799 MPH. When you watch a MotoGP race, pay close attention to the wheels on Casey Stoner’s Desmosedici GP7. You’ll notice that Ducati has switched from the super-lightweight carbon fiber rims back to spoked wheels to allow the use of Spiffy Spokes on the racer’s bike, thus accounting for his surprising win at the recent 2007 Qatar MotoGP event. A side benefit of using Spiffy Spokes is that the constant motion of the product as it runs up and down the length of the spoke prevents dirt and road grime from clinging to the spoke, allowing it to maintain its factory shine. Ducati claims that this solution will also resolve the chrome pitting problem that Ducati SportClassic owners have recently reported. 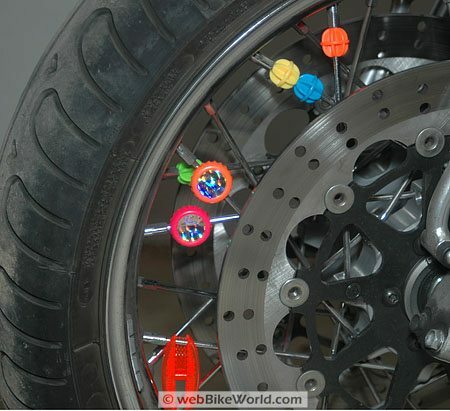 But one of the coolest features of the Spiffy Spokes are their ability to increase motorcycle visibility. “It is with question that auto drivers will look at you with surprise and compassion”, said Dottore Aprilius during our telephone interview. Spiffy Spokes are available in three different styles and it’s certainly hard to pick a favorite. 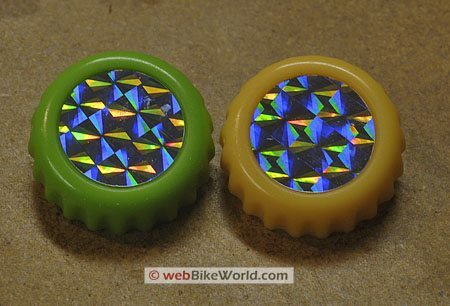 The “Bottle Cap” Spiffy Spokes are definitely the most high-tech, with their 3D holographic image glowing in a rainbow of colors as the wheel rotates. We noticed that this seemed to create a hypnotic effect on neighboring vehicles, which may or may not have the intended results for the motorcycle rider. 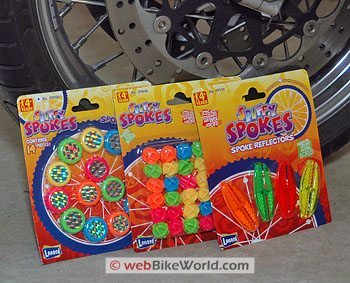 The Spiffy Spoke “Tennis Balls” are also very cool; not only do they slide up and down the length of the spoke as the wheel turns, they also spin on their axis, increasing their speed of rotation depending upon the lean angle of the motorcycle. We noticed that the balls will actually stop and reverse their spin in the twisties during tight back-and-forth turns. This is great fun to watch for the bystanders, but the rider must be careful not to try and view the Spiffy Spokes at the expense of forward visibility. Not to be outdone, the “Reflecto” Spiffy Spokes may not look as exciting at first glance, but they have become the favorite of European BMW owners, a usually stodgy bunch who have been surprisingly accommodating to the fad. “Why not have fun and be safe at the same time” seems to be the refrain heard from more than one rider. During our exclusive interview, Dottore Aprilius implied that Ducati is also working with Harley-Davidson on a special edition Spiffy Spokes application, specially designed for the thicker Harley spokes. These will be in the form of playing cards that are installed opposite each other on the spokes. As the bike increases speed, the plastic cards will actually look like a deck being shuffled. As the bike comes to a stop, the hand that is displayed can be used for recreational wagering and may also be useful for poker runs. Unfortunately, the “Big Deal” Spiffy Spokes aren’t being released today because the supplier is still trying to fine-tune the sound that the cards will make as they rotate through the spokes. 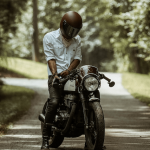 The world of motorcycle accessories has been pretty boring over the past few years, and Spiffy Spokes are the hottest thing to come along in recent memory. The best part is the price — the Bottle Cap and Tennis Ball Spiffy Spokes are available for only $1.29, while the Reflecto version is priced slightly higher at $1.59. The Big Deal playing card version will retail for $2.59 and should be in Harley dealers on June 31. Colors: Fluorescent yellow, orange, green or blue. 3D holographic on the Bottle Caps. From “H.H.”: “These things are so great, I decided to even put them on my BMW 330i. Sure it’s a car, but I figured that if Casey Stoner is using this at MotoGP level, then I should benefit from it too for my daily commute. The first issue was replacing my 18 inch light alloy wheels with something spoked. Luckily for me my neighbour’s kid didn’t mind me exchanging him for his wheels off his Datsun B210. Those steel rims were a bit dented, but with the help of a ball peen hammer they look as good as new (at night in the fog). Next stop was Pep Boys for a set of spoked plastic chrome hubcaps, then I was all set to mount the Spiffy Spokes. All I can say is wow. The difference in performing is outstanding. I never knew a BMW could drive like this! The only downside is some joker keeps putting baseball cards in my spokes. Ah well, I still give this product a 9.5/10. From “B.S.”: “I can’t tell you how cool these look on my ZX14 — I actually replaced my old chromed custom wheels that cost me $2,300 each with a 21″ spoked wheel in front just so I could use Spiffy Spokes.